The faith of each individual Christian rests upon the bedrock foundation of the Bibles inspiration. If the Bible is of human origin, then it logically follows that the facts and doctrines found therein are only as reliable as human knowledge can be. However, if the biblical records were provided by the Holy Spirit (2 Peter 1:20-21), then we have every reason to believe that the facts and doctrines recorded therein are free of those imperfections and blemishes that characterize all purely human efforts. The Greek word used in the New Testament to express the concept of inspiration is theopneustos, and itself derives from two rootstheos, God, and pneustos, breathed (from pneo, to blow or breathe). Theopneustos, therefore, would mean God-breathed. The word implies an influence from without producing effects that are beyond natural powers. The proper view of inspiration often is referred to as being verbal (word-for-word) and plenary (complete). This concept suggests that men wrote what God directed, without errors or mistakes, yet with their own personalities reflected in their writings. A close examination of the Bible reveals startling proof of its inspiration. Sometimes that proof comes in the form of prophecy (always minutely foretold and completely fulfilled). Sometimes the proof comes in the form of scientific facts that were placed in the divine record hundreds or thousands of years before they were known to the modern scientific mind. This brief article deals with the latteran important piece of scientific foreknowledge found with the biblical text that was completely unknown to man until fairly recently. In Genesis 17:12, God specifically directed Abraham to circumcise newborn males on the eighth day. Why the eighth day? In 1935, professor H. Dam proposed the name vitamin K for the factor in foods that helped prevent hemorrhaging in baby chicks. We now know vitamin K is responsible for the production (by the liver) of the element known as prothrombin. If vitamin K is deficient, there will be a prothrombin deficiency and hemorrhaging may occur. Oddly, it is only on the fifth through the seventh days of the newborn males life that vitamin K (produced by bacteria in the intestinal tract) is present in adequate quantities. Vitamin K, coupled with prothrombin, causes blood coagulation, which is important in any surgical procedure. Holt and McIntosh, in their classic work, Holt Pediatrics, observed that a newborn infant has peculiar susceptibility to bleeding between the second and fifth days of life.... Hemorrhages at this time, though often inconsequential, are sometimes extensive; they may produce serious damage to internal organs, especially to the brain, and cause death from shock and exsanguination (1953, pp. 125-126). Obviously, then, if vitamin K is not produced in sufficient quantities until days five through seven, it would be wise to postpone any surgery until some time after that. But why did God specify day eight? 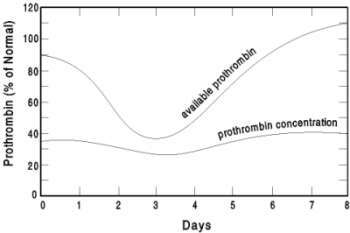 On the eighth day, the amount of prothrombin present actually is elevated above one-hundred percent of normaland is the only day in the males life in which this will be the case under normal conditions. If surgery is to be performed, day eight is the perfect day to do it. Vitamin K and prothrombin levels are at their peak. The chart below, patterned after one published by S.I. McMillen, M.D., in his book, None of These Diseases, portrays this in graphic form. Abraham did not pick the eighth day after many centuries of trial-and-error experiments. Neither he nor any of his company from the ancient city of Ur in the Chaldees ever had been circumcised. It was a day picked by the Creator of vitamin K (1984, p. 93). McMillen, S.I. (1984), None of These Diseases (Old Tappan, NJ: Revell). Originally published in Reason and Revelation, July 1993, 13:55.